Mars Curiosity Rover has finally landed in Gale Crater, defiant of the one-in-three chance of success researchers gave her. It took five years of preparation and engineering, 8 – 1/2 months of interplanetary transport, and 350 million miles; but she’s finally arrived, plum and ready to unearth Mars’ secrets. Powered by a radioisotope generator, Curiosity will transmit pictures of the Mars landscape for at least two years (quite probably many more). Ever more importantly, as she is equipped with a gas chromatograph, mass and other spectrometers, atmospheric instrumentation, radiation detectors and more, Curiosity will analyze the surface of Mars for evidence of microbial life, measure background radiation levels, and search for evidence of water on the surface [Mars Science Lab Facts]. All this sounds wonderfully interesting, and stands to keep curious minds occupied analyzing the data for years to come. But this successful landing on Mars means so much more for humankind. The ultimate hope is that Curiosity’s work will enable scientists to successfully plan and execute a manned mission to Mars. The arrival of humans on Mars presents enormous opportunity for humanity to better its probability of long-term survival. If Mars once harbored, but no longer harbors life, its study can reveal useful clues to into the life cycle of a planet and a future that our own planet could experience. If Mars is currently in an extinction cycle, studying it could lend insight to questions about the extinction cycles experienced on Earth. If Mars has water – on the surface, under the surface – it opens up a whole new world for humanity. How much Uranium is on Mars? How much Thorium? Rare Earth elements? Boron, lithium, silver, gold? Mars could be awash with resources that could sustain humanity’s future. Does Mars hold the key to a sustainable technological future? Are there ethical issues that arise with the potential exploitation of a neighboring planet that could theoretically sustain life; but is (only currently) lifeless? Curiosity has just touched the surface. There are so many possibilities laying before us. And so many questions. What is humanity’s next step? Random Rant: Are We Computers? What if we are just a more primitive kind of computer created by a much further advanced life form? In fact, humans could just be an evolved form of machine. First, there were the single celled organisms. Even humans use single celled organisms to produce energy and life-saving products such as BEER!!! (Okay, okay, penicillin) Then, the dinosaurs. And all the prior manifestations of mankind. We have finally evolved into super random access memory biological machines. We can even repair ourselves! We make a product, surely. What if we are just a machine that someone made to produce something? What if we are just a more primitive kind of computer created by a much further advanced life form? The life we know may not be the only type of “life” in the universe. We could be someone’s coincidental science experiment – a self sustaining machine made of billions of self sustaining micro processors. A universe within a universe. And what is our product? Carbon dioxide? Heat? Rubber duckies? Could the computers we create be the next step down in computer evolution? We strive to create more and more life-like computers and artificial intelligence. But maybe we are more sophisticated gadgetry than the ai we attempt to birth. We could BE that artificial intelligence. We think we are real and that life as we know it is the only kind of life in the multiverse. But we could just be some tossed aside digital terrarium experiment that makes rubber duckies. Author NuclearGrrlPosted on July 1, 2012 Categories atheism, ScienceTags Artificial intelligence, Computer, Evolution, Human, Machine1 Comment on Random Rant: Are We Computers? Even knowing the rocket is well off on its way, set to land just 55 days from today, I knew I’d be waiting even longer than that. Curiosity was scheduled to take many months to reach her – yes, I’ve made her a grrl. It’s only fitting – primary research subject. But Curiosity announced today on her twitter feed (@MarsCuriosity – you really should follow her!) 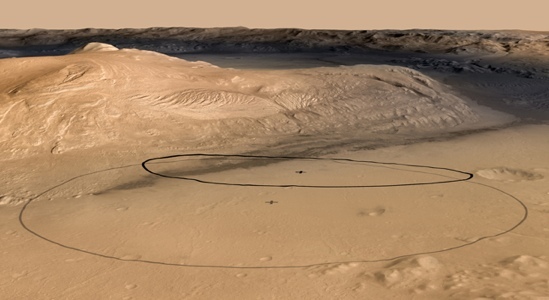 that her landing site has been adjusted and she’ll only have half the distance to travel to get to Mount Sharp. And when she does, we are in for a great treat my lay reader friends! Curiosity seeks answers to the most profound questions of the universe (for humans, anyway). Did life exist on Mars? Are we alone in the universe? What kind of environments can support life? Could Mars once become inhabitable again? These questions are what keeps me excited about the space program and about Curiosity. I simply cannot wait to see what Curiosity turns up next!